This salmon recipe is probably the most delicious salmon recipe I have ever made; salmon with a blackberry champagne mustard glaze. Awesome! I failed to mention this recipe is extremely easy. Just my speed, "easy and elegant". The best part, my family LOVED it. They didn't even need the "one bite rule" enforced. Preheat oven to 350 degrees. Line a baking pan with parchment paper. Sprinkle salmon with Cherchies® Garlic Seasoning and pepper. 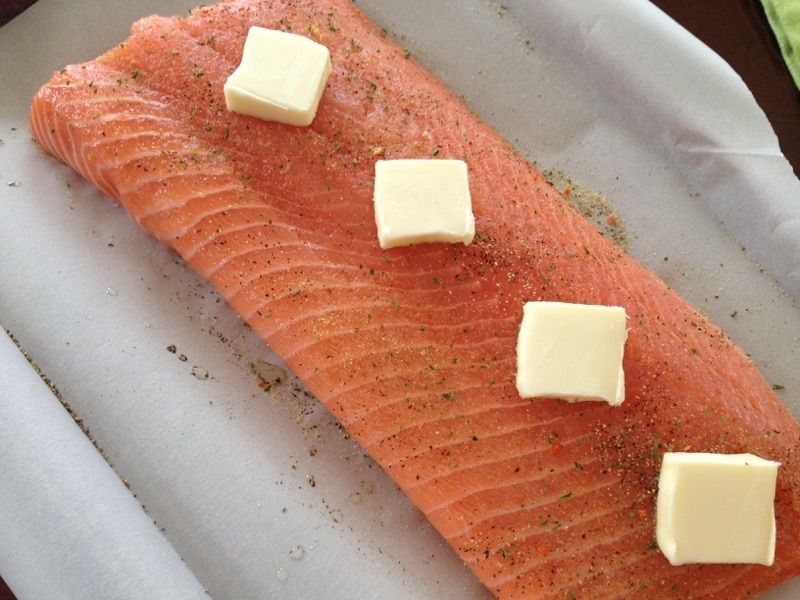 Divide the butter into Tablespoon (Tbsp) portions and place on salmon a few inches apart. Meanwhile, in a small bowl, mix together Cherchies® Champagne Mustard and Cherchies® Blackberry Preserves until blended. Slather the mixture over the salmon. Bake the salmon in the oven for 20 minutes, or until salmon is cooked through (breaks apart easily with a fork).